One explanation for the origins of rivers was that they were the milk of Papatūānuku, the earth mother, but most rivers also had another, unique story of their origin. 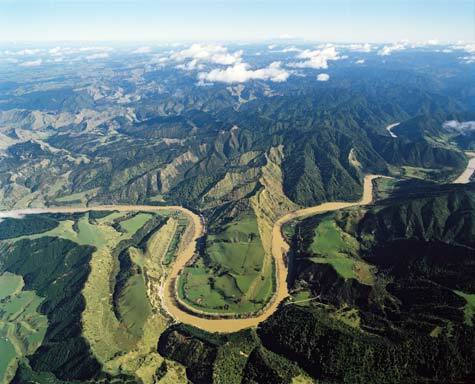 There are different tribal accounts of how the Whanganui River was formed, but they all begin with the mountains of the central North Island. One story is that the mountain Ruapehu suffered from loneliness, so Ranginui, the sky father, laid two teardrops at his feet, one of which became the Whanganui River. But Ruapehu was still lonely, so Ranginui sent four mountain companions: Tongariro (to guard the teardrops), Ngāuruhoe, Taranaki and Pīhanga, the mountain maiden. Pīhanga was promised as Tongariro’s wife, but she was tempted by the charms of Taranaki. On Ruapehu’s advice, Taranaki reluctantly left the mountain enclave. He followed the route of the Whanganui River to the coast before heading west, from where he gazes back towards his former companions.